A Congolese miner digs for cassiterite, the major ore of tin, at Nyabibwe mine, Democratic Republic of Congo, Aug. 17, 2012 (AP photo by Marc Hofer). 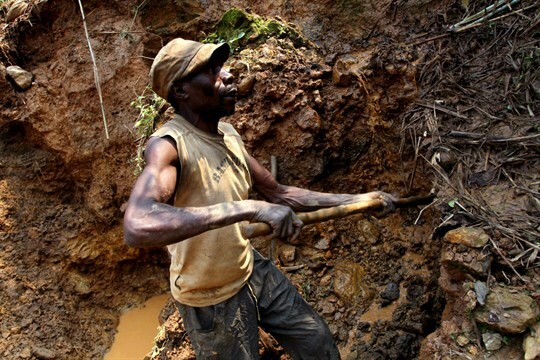 After more than five years of negotiations, Joseph Kabila, president of the Democratic Republic of Congo, signed into law a new mining code earlier this month. The code faced strong opposition from mining companies, which now face higher royalties and taxes. The government has said it may be willing to negotiate terms on a case-by-case basis. Congo has extensive mineral wealth and is the top source of cobalt globally and the top source of copper in Africa. In an email interview, Thomas Lassourd, a senior economic analyst at the Natural Resource Governance Institute, or NRGI, discusses why the government decided to push forward with the new code, how it affects transparency and accountability, and the obstacles to its implementation.